Thankfulness and relief fill my heart whenever I stumble over a recipe like this one. Donna Hay’s Spiced Chicken & Chorizo Couscous from No Time to Cook proved to be delightfully fast to make in just one pan, flavoursome and inexpensive to make. My kids ate stacks of it, asking for more long past their usual limit and it was so simply done that I was able to talk on the phone at length while making it, which happens so rarely in my household in this stage of life. A few comments about Chorizo: I’ve noticed they regularly come on special for half price at the deli at my local Woolworth’s about once every two months, so I tend to buy up then and freeze them in small quantities for meals like these. Even so, this tasty crowd pleasing dinner, which serves 6-8 costs no more than $14 to make. Place onion, chicken, chorizo, chilli and garlic into a non-stick frying pan over medium-high heat and cook for 5-6 minutes or until chicken is browned. Add couscous, stock and water to the pan, cover and simmer over low heat for 2 minutes or until couscous is tender. 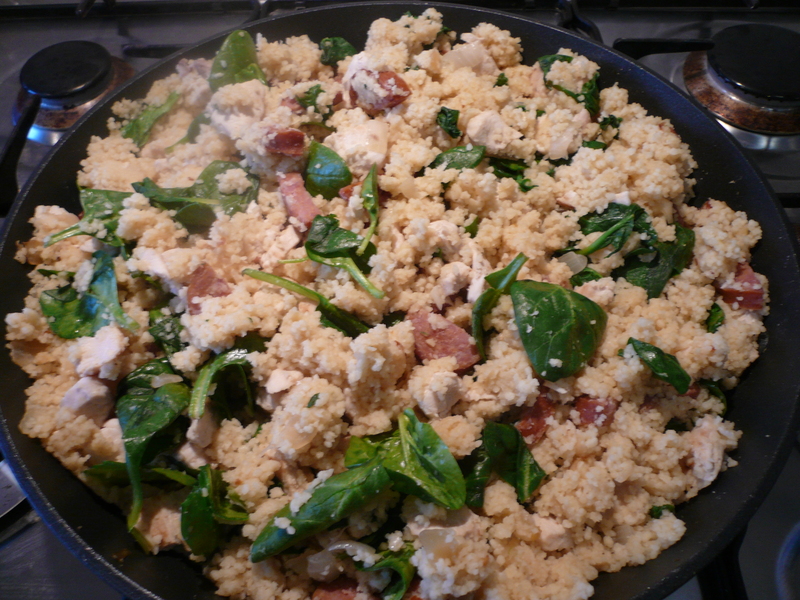 Stir spinach and olives through couscous mixture and serve immediately. This was beautiful thanks Jane, and love the tip about half price Chorizo at the deli. We love Chorizo so has been a real saver!